Did global warming cause OK & TX flooding? (by the Editors, Investor’s Business Daily) – Deadly flooding in Texas and Oklahoma is being blamed on global warming. Last year, when Texas was in a drought, global warming was also held responsible. Has anyone thought that maybe it’s just the weather? ‘Torrential downpours and events like this are consistent with the general theory of global warming,” Dave Schwartz of the Weather Channel has told the International Business Times. So, we have to wonder, what about last year, when Texas had to worry about a shortage of rain and parched earth? Surely if heavy rains are deviations from the norm caused by global warming, then the dry conditions found in Texas must be natural and not the product of man-made climate change. Well, not in the eyes of those who see man-made global warming as cause for every weather event that seems to be outside the ordinary. Last year during that harsh drought, they were also happy to lecture the public about global warming’s role. “More Drought, Heat and Water Wars: What Climate Change Already Means for Texas” screamed a May 6, 2014, National Public Radio headline. So, yes, global warming causes drought – and it causes heavy rain. 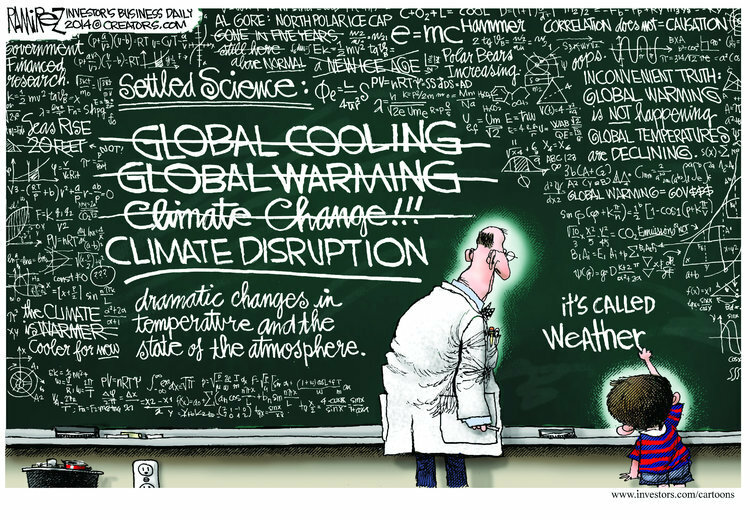 In fact, it doesn’t matter what the weather does; there is a faction out there that’s always prepared to say that human-caused emissions of carbon dioxide are responsible. The rational explanation for what appear to be weather extremes is actually found within the International Business Times story we cited above. Neither drought nor hard rain is new to Texas and Oklahoma, whose histories are filled with excessive wet periods and extreme dry spells. This cycle was spinning before we began emitting CO2 and it will still be spinning after our CO2 emissions have ceased. These are facts, but some want the rest of us to forget them. Published May 27, 2015 at news.investors.com. Reprinted here May 28, 2015 for educational purposes only. 2. What is the opposing view to this opinion? What is your response to this assertion? Agreement or disagreement? Explain your answer. If you disagree, explain why you believe the editors are wrong.